The elephant moves slowly and steadily, that's why this type of safari is ideal in and around the wild regions or within the vicinity of the wildlife sanctuaries, where riding the elephant can give you an easy excess for viewing the wildlife. More of all a elephant safari tour in the tropical wildlife sanctuaries of India gets you up, close and personal with these majestic animals. 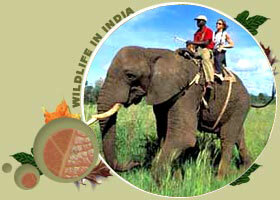 The modern day elephant Safari: Equipped with a howdah, a large seat on which they would sit, complete with soft silk cushions, and with a ceremonial umbrella over the riders head, modern day elephant safaris may lack in comparison with the ones that use to be done by the kings, but are no less royal on that account. Since elephant safari is an elaborate affair, and requires many attendants for the elephant as well, such safari camps too tend to be a more lavish, and make the best choice for the incentive groupups who are promised to get a journey to remember. Just like the tours there are certain essentials you have to keep in mind for elephant safari trip too. The weather conditions can vary a lot, especially in a desertic or tropical climate you require a good backup of plenty of portable water to avoid dehydration as well as sun screen, goggles, and a first aid kit. The clothes that you are going to wear should also provide your skin breathing space, because of the hot climate you are tend to sweat. Visitors are requested to dress modestly. Some kind of head protection is essential too.